Stefano Pierini was born in the Chianti countryside, experiencing a strong farming tradition enriched by the tastes and colours of these lands. He reached the kitchen following his instinct, which over the years became passion and professionalism. Curiosity led him to experiment with different experiences also devoting himself to the culinary tradition of other Italian regions and to the catering sector. This enhanced his fantasy and organisational capability also in large banquets. He collaborated for years with Stefano Azzi at his "Osteria del coro" in the centre of Siena and during this time he gained additional professional skills and obtained various acknowledgements. In 2004 he took part in the last edition of "Girogustando", a venture promoted by the Federation of Italian Trade, Tourism and Services. In 2004 he started as a professional and collaborated with the Fuligni estate where he organised a gala dinner for Archduke Sigismund, Archduke of Tuscany on the occasion of the second place reached by Brunello Fuligni 1999 in the prestigious classification of Wine Spectator. 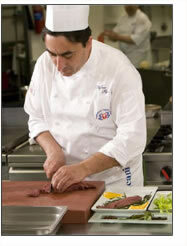 Registered as a professional with the Italian Chef Federation since 2003. In 2005 he flew to Hanover in Germany to combine traditional Tuscany cuisine with the presentation of a wine estate "Il Molino Di S. Antimo" that makes an excellent Brunello di Montalcino owned by his dear friend Carlo Vittori. In 2006 and 2007 in collaboration with the Tourist Agency of Chianciano he took part in the Twinning with the new province of Monza and Brianza, organising a series of gala dinners to promote the local products. Still with Vittori in 2007 he organised a series of theme dinners at the Verona Vinitaly. He is currently Substitute Vice Chairman of the Siena Chefsâ€™ Association, regional member of the Tuscany Regional Chefsâ€™ Association (URCT) and member of the executive board. In 2007/2008, as a member of the Tuscany Haute Cuisine Team, he flew to Madrid (Spain) for the Tuscany wine and gastronomy week and recorded his first DVD for training all the chefs of the famous EL CORTE INGLES chain. He was born at Termoli, the Samnite land with its wealth of strong colours and delicate fragrances. His enormous passion for cooking led him to seek new horizons in the culinary field, beyond the borders and tastes of his homeland. In Siena, where he lives and is about to get a degree in economics, he specialised over the years in Tuscany regional cooking collaborating c/o various restaurants and inns in the centre. He took part in Girogustando 2005. 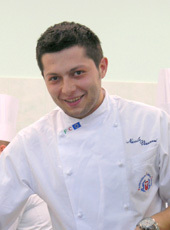 He continued his training abroad, working for a year in Finland with the Chef Sergio Maniscalco. On returning to Italy he further specialised and joined the F.I.C. 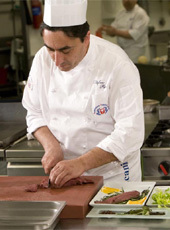 (Italian Chefsâ€™ Federation) as professional chef also undertaking the position of secretary of the Siena Chefsâ€™ Association. 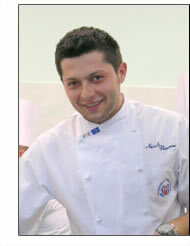 Since 2008 he is a member of Tuscany Haute Cuisine Team, a team of the Tuscany Regional Chefsâ€™ Association (U.R.C.T. ), with whom he has taken part in considerably important events and competitions. Still in collaboration with the U.R.C.T. he went to Poland to teach emerging local chefs c/o various hotel facilities about traditional Tuscany dishes and to promote typical Siena products. He then went to China to the city of Hong Kong as the ambassador of Italianâ€™s Food, every day presenting samplings of products like Tuscany DOP ham, extra virgin olive oil and Siena pork. His passion and knowledge acquired over the years about Tuscany and international haute cuisine led him to collaborate with Stefano Pierini and the staff of â€œCuoco a Domicilioâ€�. ® 2008 Cuoco a domicilio di Stefano Pierini - P.I. 01176090528 - staff@cuocoadomicilio.info | design by S.G. Consulting s.r.l.